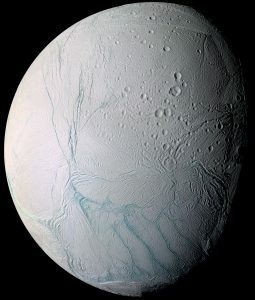 An unexpected finding by NASA’s Cassini spacecraft during its first close flyby of Saturn’s moon Enceladus has led to the discovery of its subsurface ocean, which could, possibly, host microbial life. After arriving at Saturn in 2004, Cassini made its first closest approach – at an altitude of 1,167 kilometers (725 miles) – of Saturn’s sixth largest moon on February 17, 2005. The flyby was part of the spacecraft’s detailed study of the planet’s icy moons. As Cassini flew by Enceladus, the spacecraft’s magnetometer, which measures the magnetic field in the area, detected an anomaly, suggesting that the 157-mile (252-kilometer) moon had a thin atmosphere. Orbiting in the middle of Saturn’s faint E ring, Enceladus is the Solar System’s most reflective object, but scientists attributed this brightness to the emission of ice dust from its surface and believed the small moon to be an inactive world. 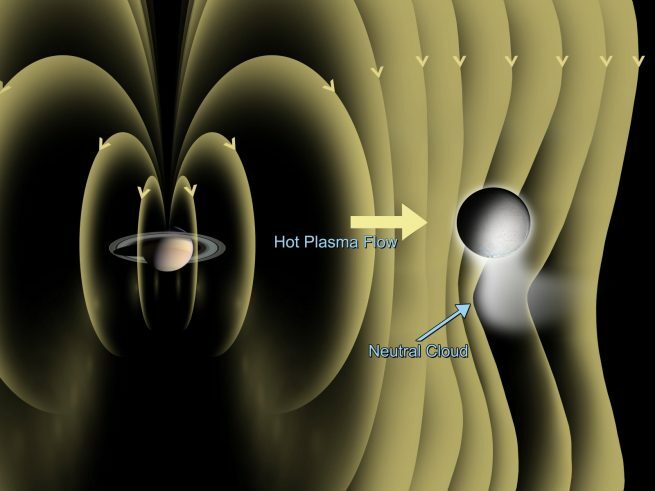 However, inexplicably, Saturn’s magnetic field was being perturbed above Enceladus’ south pole. Because of the unusual findings, Cassini flew even closer – at an altitude of 497 kilometers (309 miles) – to the small moon just several weeks later, on March 9, 2005, to obtain a better look. The fact that Enceladus resembled a comet actively emitting gases led scientists to speculate its atmosphere is somehow replenishing these gases. Some scientists excitedly speculated the south polar plume came from jets, but members of Cassini’s imaging team were skeptical and wanted to make another pass at the small moon before confirming anything. That led to a third flyby on July 14, 2005, this time coming within just 168 kilometers (104 miles) of Enceladus’ surface, which put an end to the skepticism. 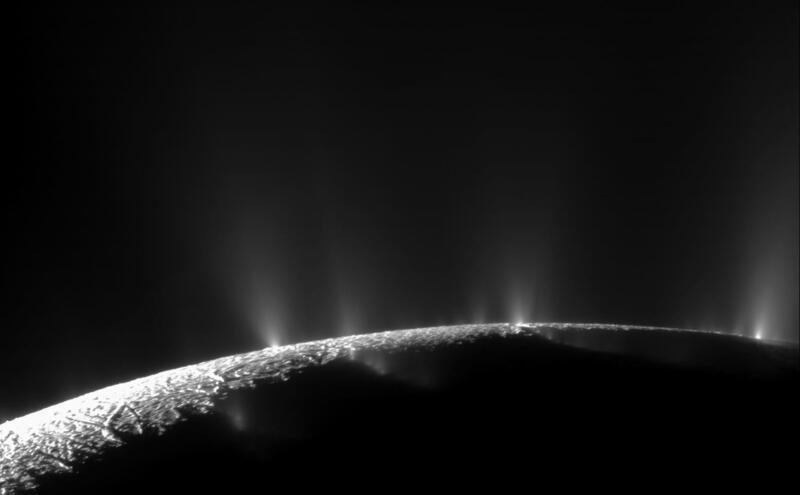 From that vantage point, the mission team was able to see geysers of water vapor and water ice particles streaming out of Enceladus’ south pole. Cassini’s science instruments studied the region, imaging the now-famous cracks and tiger stripes, along with heat being emitted from the stripes. These discoveries dramatically altered mission plans. “Enceladus was so exciting that, instead of just three close flybys planned for our four-year primary mission, we added 20 more, including seven that went right through the geysers at the south pole,” noted Cassini project scientist Linda Spilker. Subsequent flybys confirmed that the plumes are emitting organic material in addition to dust, water vapor, volatile gases, salts, and silica. “The surprising magnetometer reading led us to the liquid water ocean underneath Enceladus’ icy crust,” Spilker emphasized. From Cassini’s extensive study of this small world, scientists concluded in September 2015 that an underground ocean is present and suspect Enceladus’ interior is being heated by tidal forces from Saturn, meaning it could potentially support microbial life. “That has altered the way we think about where life might be found in our own Solar System, and in the worlds beyond,” she added. Microbial life has been found in underwater hydrothermal vents on Earth and could, possibly, exist in such vents on the floor of Enceladus’ global salty subsurface ocean. Enceladus joins a growing list of ocean worlds that could potentially harbor such life, including Jupiter’s moon Europa, fellow Saturn moon Titan, Neptune’s moon Triton, and even possibly dwarf planets Ceres and Pluto. This article was last updated at 21:05 EST on Feb. 23, 2017. This story is not accurate. The first sighting of the plume was in Jan and then Feb 2005. Our images are released to the public immediately and the plume and its implications were excitedly being discussed on the internet. This was BEFORE the magnetometer saw anything. Furthermore, no one at that time could say the plume was coming from an ocean. The imaging team first showed the plume (and the jets we saw in November) were coming from liquid water; everyone else said evaporated ice. The ocean suggestion was a few years off in 2005. Thanks for your comment. However, if there are inaccurate statements – this is a problem with NASA – not SpaceFlight Insider. We respectfully suggest you take this up with JPL/NASA.